I am taking a walk along the path where history interacts with geography and words rub shoulders with images – the vintage postcard path. The destination doesn’t matter and the route is determined by the random selection of old postcards I have bought at antique fairs and auctions. Number 12 in the series sees us return to a familiar recipient and an unfamiliar park. Given the length and complexity of the journey of a typical vintage postcard I am always surprised by their ability to stay in close proximity to their deltiologocal cousins. I am not particularly thinking about those original journeys undertaken 100 or more years ago, but their subsequent ramblings from shop to shop, fair to fair, sellers’ tray to sellers’ tray. 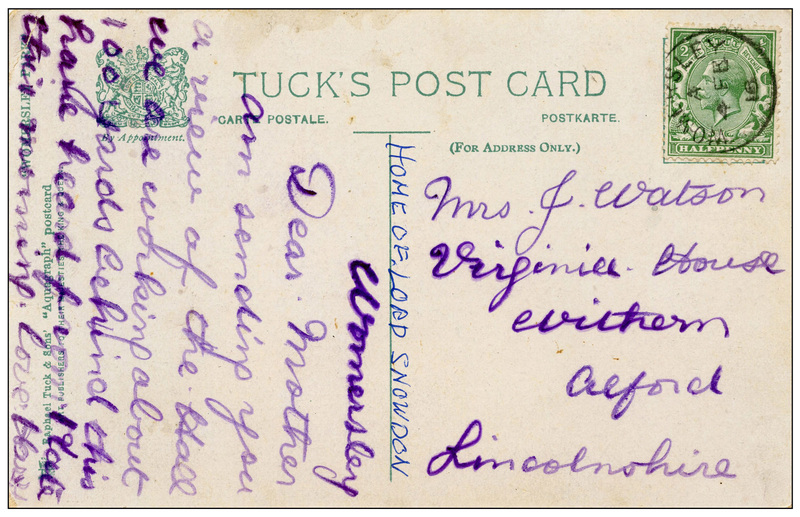 You may recognise the recipient of this card which was posted almost 100 years ago from an earlier post in this series (“To The American Colonies, If Fine”). One can only assume that Mrs Watson’s collection of old postcards was sold as a job lot and, despite the chance pickings of illogical collectors such as myself, some at least have managed to stick together. Whilst the recipient is familiar, the location of the illustration is not, which is something of a surprise as it is not all that far away from where I live. Womersley Hall is a seventeenth century house near Pontefract in West Yorkshire which, according to the snippets of news I can find about it on-line, has drifted slowly into dilapidation over the last couple of hundred years. Some hand – I like to think it might have been Mrs Watson as an elderly lady – has appended the postcard “Home of Lord Snowdon”, and indeed the hall was the childhood home of Anthony Armstrong Jones who went on to marry Princess Margaret and became Lord Snowdon. He became quite a celebrity in the early sixties – he had a job which was so rare for a member of the Royal Family that it attracted considerable comment – and I suspect the information about Womersley being his family home was added to the card then. And now, 50 years later, Lord Snowdon has become a footnote in history and Womersley Park is as famous for being the subject matter of one of Mrs Watson’s cards as for being his home. Well almost.